*The engagement ring goes into the wedding ring which has a great meaning as both events form part of your union for the rest of your life. *The engagement ring can be worn separately on another finger. *The engagement ring can be made with a different stone which will give you the option to wear another ring from time to time. I have this idea of when I will give birth to our first child, Frederic will offer me a reproduction of the engagement ring with a tanzanite to remind me of the birth of our child. *It represents the universe. We got married in the desert of the Karoo where the stars are very intense and it is a reminder of that special night. *It is made of white gold but can be made with pink or yellow gold or even platinum. What ever you decided to do with it, copyright applies on this model. If you are interested in getting a quote for this ring, please complete the form below. I knew that I wanted something special for my wedding ring and the idea I had was to have the engagement ring and the wedding ring as a set of one. The other thing I had in mind, knowing me and my love for changes, I wanted to have a ring with could offer me different possibilities of wearing it. I could not find anything in the shops, it was too classic. 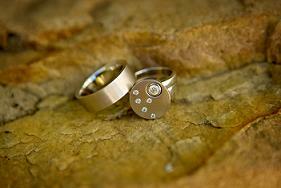 A friend of mine gave me the name of a ring designer and manufacturer and I made contact with them. I took a pen and paper and within a few minutes, I drew the sketch of my wedding ring!!! I phoned my husband to be at that time to inform him...I was so excited! I have submitted my design to the manufacturer, they gave me a quote and we gave them the go ahead. I was so happy when I went to fetch it! The manufacturer has never done something like that and he said to me that their designers were amazed by it! I was so proud! I have never had such a beautiful ring in my life and it is so special for me to wear it every day. It is actually quite often that people who sees it ask me where I bought it! And amongst these people, lots said to me that I should commercialize it so here it is! Ready for you to be ordered! Ah! And I am not sure where you would like to get married but I should have a look at http://www.beautiful-beach-weddings.com , a veteran wedding planner shares her secret beach wedding planning tips. She will show you how to avoid bumps along the way, stay focused, keep a sense of humor and remain in love!